A sprained ankle may seem like a minor inconvenience, but it can badly worsen if you don’t get treatment when you need it. 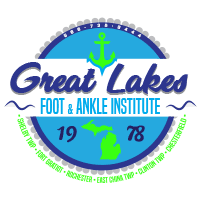 The skilled podiatrists at Great Lakes Foot and Ankle Institute PC, with locations in Chesterfield, Clinton Township, Fort Gratiot, East China Township, Shelby Township, and Rochester, Michigan, can diagnose and treat your sprained ankle to get you walking again without pain. Book your appointment online or by phone now. Ankle sprains happen when you accidentally put too much force on your ankle, typically as your ankle turns at an unnatural angle. When you sprain your ankle, you can stretch or even tear the ligaments that surround your ankle bones. Ankle sprains can range from minor to quite serious, with the more serious sprains potentially looming as long-term issues. If you have a sprained ankle, you may have all of these symptoms at one time. Usually, the symptoms start fairly quickly or even immediately after your injury or accident. Treating a sprained ankle usually starts with resting and elevation. Ice application is the most effective way to lessen swelling, and you can also take an over-the-counter pain reliever if needed. Your Great Lakes Foot and Ankle Institute PC podiatrist may use compression bandages or a splint to immobilize your ankle so you can heal effectively. Platelet-rich plasma (PRP) therapy involves deriving a high concentration of platelets originating from your own blood and injecting it directly into the site of your ankle sprain. The PRP encourages faster healing, and it can greatly reduce your recovery time. If your sprained ankle is severe, you may need surgical repair of your damaged ligaments. During your surgery, your podiatrist may also use PRP to help your body naturally repair the ligaments even more quickly. Many athletes who need the fastest possible recovery opt for surgery and PRP. Your podiatrist at Great Lakes Foot and Ankle Institute PC will work with you to create a treatment plan that fits your needs and lifestyle. How can I prevent future ankle sprains after I'm recovered? After you've recovered, you can take a few simple steps to discourage a re-injury. Your podiatrist might recommend the following. Your podiatrist may also have other customized suggestions to help you prevent re-injury. Use online scheduling or call now to book your appointment at the Great Lakes Foot and Ankle Institute PC location closest to you.